We’re in the market for a new car and we’re taking you along with us! It’s time to retire our 2005 Honda Element after 170,000 miles of rugged use. We’re going to keep the Element for hauling but it’s time to take it out of daily use. Since we’ll still have the Element for cargo, we want to replace it with a compact car. 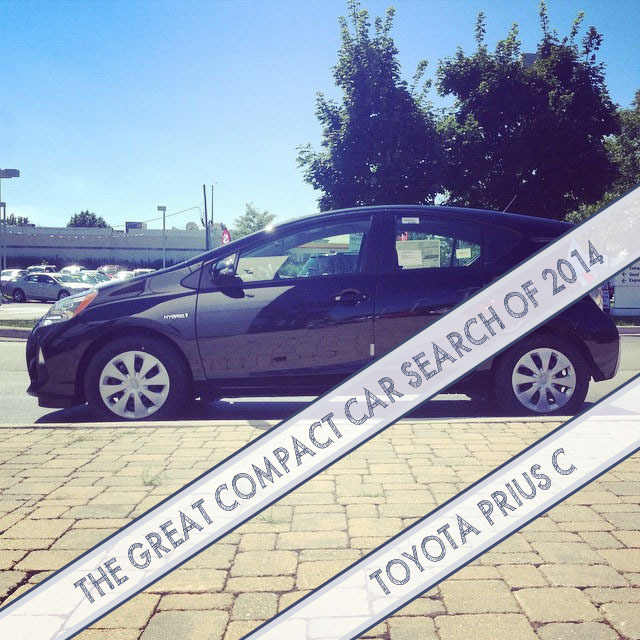 Follow along as we go on the great compact car search of 2014. Last time, we drove the Scion IQ. This time it’s the Toyota Prius C.
When I bought a used 2007 Prius a year and a half ago, I became an instant fan of hybrid vehicles. Once you start averaging 45 MPG you start to feel like a chump for driving anything else – especially a small SUV that gets about 25 MPG at its best (I’m looking at you, Honda Element). Fuel economy is especially important now that we’re logging a lot of miles traveling between the city apartment and the “country house.” Now that Toyota has added a compact hybrid to their line with the Prius C, we decided to take a test drive as part of our car search. The finishes on the 2014 Prius C Two that I drove feel a little cheaper when compared to my 2007 Prius. It’s a reminder that this is Toyota’s cheaper, entry level Prius. Since I drove the “Two” model, which is more in our price range for a compact car than the Three or Four, I wasn’t able to experience all the bells and whistles, like push button start and smart key. There are steering wheel controls for radio, phone, climate and information (gas mileage, odometer, etc.). All of the car information appears beside the speedometer at the top of the dash, not quite in the center of the car but also not directly in front of the driver. It’s a good location for it, actually. The USB/Auxiliary port are also on the dash, over near the passenger side. The heat and radio controls are intuitively placed on the center console. In my 2007 Prius, the heat is controlled via a touch screen in the middle of the car. This is a plus as far as I’m concerned. Call me an old fogey but I actually prefer dials and levers for controlling climate. In my opinion, fiddling with a screen is too distracting and takes my eyes off the road for too long. The gas tank holds 9.5 gallons and fuel mileage is estimated at 50 MPG combined. If that’s true, we could drive over 450 miles on one tank of gas! To make the most of fuel consumption, the Prius has ECO and EV modes. The ECO mode modulates climate control and adjusts throttle response to maximize fuel economy. EV mode operates solely on the battery. Now, about that test drive. The acceleration is what you would expect from a Prius. You won’t exactly be winning any drag races but it’s certainly not lagging either. There was more engine noise inside the cabin than I was expecting. Our 2007 Prius is relatively quiet, even when really pushing the pedal down to get onto the highway. As I accelerated onto the expressway in the Prius C, I could hear a great deal of engine noise. Still, the car drives nicely – it absorbs bumps and pot holes and steers around tight corners really well. 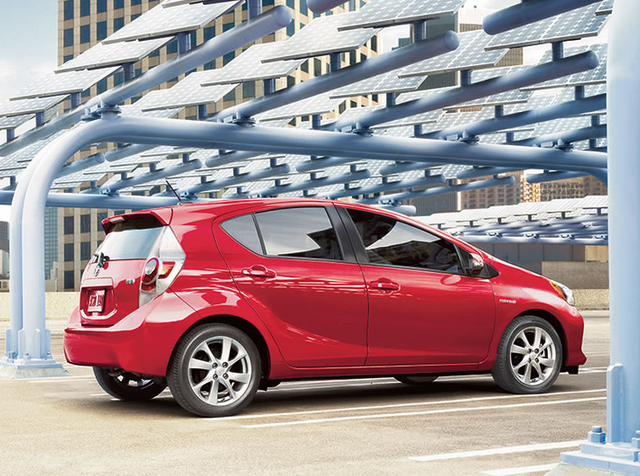 Verdict: The Prius C is definitely a top contender for our new car. Toyota’s high dependability record and the Prius’s fuel economy are both pluses. This entry was posted in The Great Compact Car Search of 2014 and tagged automotive, car shopping on 09/10/2014 by Jason.